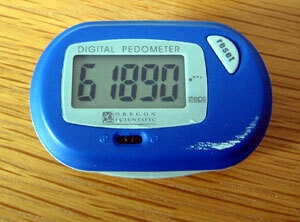 So i bought one of these pedometer things for a tenner and wore it for 96 hours before the novelty wore off – that’s ~15,500 paces per day. So that means i should be as thin as a rake and as fit as a fiddle, right? A Whatfettle article by Paul Downey published Thursday, August 12th, 2004, at 6:23 pm under a Creative Commons License.